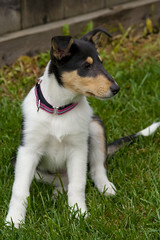 My two newest fosters arrived a couple days ago from the Collie Rescue of Greater IL. They are two adorable bundles of fur (i.e. 8 week old collie puppies). 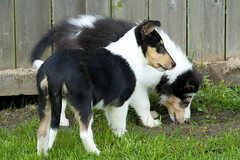 Junior (rough coat) and Lexie (smooth coat) were originally purchased from a breeder. After the owner found out they each had a detached retina (which means they are blind in one eye) they didn't want them anymore. That's when Collie Rescue swooped in, saved them, and is now looking for new homes for them who will love them the way they are. Despite each being blind in one eye, it doesn't phase them a bit. In fact, you'd probably never even notice. They are just a couple of happy-go-lucky pups without a care in the world. Junior is a typical boy... running and romping and getting dirty is the name of the game. He is outgoing, bold and very adorable. 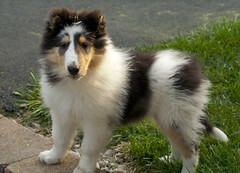 His blue merle markings are just stunning and he often has a lot to say.